In a Greenpeace study that occurred in June 2018, researchers found microplastics and persistent chemicals in the majority of water and snow samples taken. The discovery of completely artificial materials in the most pristine environment on Earth is a symbol so profound that it should give most readers pause about the effects that our species is having on its one-and-only ecosystem. While governments including the E.U. and India moved to ban single-use plastics, scientists like Javier Gomez Fernandez, assistant professor at the Singapore University of Technology and Design (SUTD), are developing sustainable alternatives to the current deluge of plastics that can’t be easily degraded. Fernandez and the Fermart Lab at SUTD have developed an easily biodegradable material made of two of the most common organic compounds on Earth. This material was then used to 3D print a large-scale wind turbine blade. Engineering.com reached out to Fernandez to learn more. Typically associated with plants, cellulose is, as Fernandez’s study describes it, “the most abundant and broadly distributed organic compound and industrial by-product on Earth.” However, to use cellulose in the same way plastics might be used, it is usually combined with polluting derivatives or plastics. Additionally, large-scale manufacturing with cellulose is difficult and making the material is expensive. To tackle these problems, SUTD researchers turned to a fungal-like class of eukaryotes known as oomycetes. Their structures combine cellulose with the second-most abundant polymer on the planet: chitin.Inspired by this newly studied species of oomycetes, the SUTD team mixed small amounts of chitin with cellulose to create an organic, biodegradable composite they call fungal-like additive material (FLAM). FLAM is produced by combining a chitosan solution and cellulose in an industrial dough mixer. Once made, it can be shaped using various techniques, according to Fernandez. “We have demonstrated that FLAM can be 3D printed or casted, as well as manufactured using common regular woodworking techniques(e.g. sawing, drilling, polishing…), and, what is more interesting, combinations of them,” Fernandez said. To print the material, the researchers used an industrial robotic arm outfitted with an extruder and pressure tank. 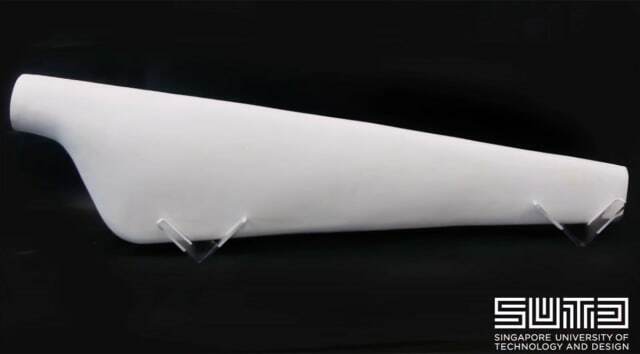 The first object printed with the material was a wind turbine blade measuring 1.2 meters in length, which is quite large in the world of additive manufacturing (AM). The use of 3D printing made it possible to make the inner core of the component lightweight and incorporate ventilation. The 3D-printed core, made up of two halves glued together with FLAM, was then coated with a 3 mm layer of FLAM that was sanded down for a smooth finish. The end result was 50 percent hollow and weighed only 5.28 kg. But how well does FLAM perform compared to traditional materials? Unfortunately, materials made from oomycetes are not well characterized in terms of mechanical properties at larger scales due to the difficulty of making large-scale parts. However, Fernandez does believe that even industries like aerospace and the auto industry could produce non-structural parts using a “cheap, low density and fully natural composite” like FLAM, which has a density of only 0.37 gr/cm3. The material also costs below $2/kg, “which is in the range of commodity plastics and less than one-tenth the cost of common 3D-printing filaments,” according to Fernandez. Since it’s so low in density, it is cheaper than commodity plastics in terms of printed volume. Though it’s possible to manufacture with FLAM using more traditional techniques, AM was chosen because the construction of very large turbine blades requires a great deal of manual labor. It was also chosen “in part to demonstrate the potential for circular economy enabled by additive technologies,” according to Fernandez. The professor pointed out that even biodegradable plastics, such as corn starch-based polylactic acid (PLA), often require the use of an industrial composting facility. He also highlighted the fact that the cost of waste management increases as the use of plastic increases. Unlike PLA, FLAM does not require a compositing facility in order to biodegrade. The professor also pointed out that because FLAM is made from “the two most ubiquitous natural molecules on Earth, without modification,” it could potentially be used “in every ecosystem on Earth.” He also underscored the fact that those materials are common byproducts in industry. The current production and consumption paradigm is a highly unsustainable and exploitative one in which purchase products made from materials and by workers in the Global South are shipped on CO2 emitting vehicles to consumers in the Global North. Once used, the item is often thrown away. 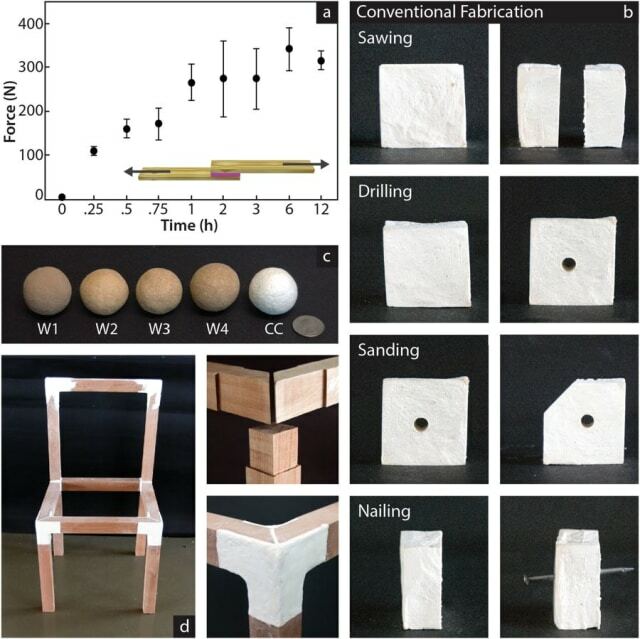 Fernandez explained that his team is able to make FLAM using “any source of cellulosic material.”It may even be possible to take an old coffee table, or even old cotton T-shirts, and turn them into a new coffee table. The genesis of FLAM began about six years ago when Fernandez was at Harvard, where he began pursuing the use of biological materials in engineering. This ultimately led Fernandez to pursue what has become FLAM. The research team is now seeking industrial partners to bring FLAM out of the lab and into suitable applications. At the same time, they are also aiming for larger parts, according to Fernandez. While he doesn’t see many obstacles to widespread adoption of FLAM, he did say that the importance of the material may be hard to grasp for those outside of his academic field. To learn more about the Fermart Lab, visit the lab’s website. The paper detailing the development and 3D printing of FLAM can be found at Nature.